Billy Wilder’s The Apartment does in a little more than two hours what Madmen attempts to do in seven seasons and doesn’t come close to the sharp biting observations that Wilder and IAL Diamond (his co-writer) have overstuffed this comedy classic with. Wilder’s “rom-com” is definitely a com but not much of a rom… but that isn’t a bad thing. In fact, The Apartment does not utter that clichéd refrain until the very last moments is a testament to Wilder’s refusal for schmaltz and the film’s enduring nature. The sour bitter pill that Wilder and Co. make you swallow about corporate America is eased through with the pinch of the sweetness of the burgeoning relationship between Bud ‘C.C.’ Baxter (Jack Lemmon) and Fran Kubelik (Shirley MacLaine) at its end. Many who have never seen The Apartment will be shocked and delighted by just how modern it is, even by 2017 standards. Wilder and Diamond were disgusted by corporate America even then, showing how Executives had no problem with manipulating anyone for their own earthly delights. Baxter, we learn quickly has become a cuckold pimp of sorts; allowing the senior executives above him use his apartment for rendezvouses with their mistresses. Baxter turns a blind eye because like all of us he dreams of being a resident of Ivory Tower. Wilder and Diamond do not let Baxter off the hook, he suffers continually because of this bargain with a harem of devils. It would only be when the true devil appears in the form of Jeff D. Sheldrake (Fred MacMurray) would Baxter’s true dilemma and our story begin. Sheldrake gives Baxter what he wants, that cushy corner office but at what cost? Baxter quickly realizes what the cost is and is at first okay with this. Wilder makes it implicit without ever saying it outright that Baxter is a pimp. He may not sell women’s virtues but he certainly allows them to be exploited in his home, in the very bed he sleeps in. All in the name of the corporate American latter. Part of the genius of the story is how Wilder never turns a blind eye to anyone in the story, especially not Baxter. Lemmon as Baxter perfected the ‘cog in the system’ to poetry. No one, even Lemmon himself, would ever do it better than in The Apartment. His twitchy delivery, the hunched over walk, the sunglasses, the cold, the resignation still feels vital and fresh in this performance. It’s not that Baxter is a pushover but it’s that he allows himself to be a pushover. That wherein lies the beauty of the performance. Lemmon and Wilder understand it’s the trade-in of Bud Baxter’s moral compass that is the quandary and drama of The Apartment. Shirley MacLaine as Fran Kubelik may be one of the first permutations of the “manic pixie dream girl” but in the actresses hands, it is anything but. Kubelik may be the dream that Baxter pines for but we quickly find out she is anything but. Wilder and Diamond give MacLaine a complex character that isn’t just there to be “won” but someone who is attempting to figure out who she is and what she wants to become. Fran is as resilient as steel. Watching her navigate day in and day out the men that berate (and even assault) her is perfected deflection. Fran understands what her spot is in the world and what she must do to survive. MacLaine never lets you forget that Fran though charming is someone who lives and breathes for herself more than she does for a man. Even her final iconic last line echoes as a defiant stance against conforming to the happy ending. MacLaine would not get anything this grand until close to twenty years later with Hal Ashby’s Being There. The Apartment is one of those rare movies that deserved and won all the Oscars. Many have imitated but none have been able to reproduce the charm, biting humor and critical eye that The Apartment gazes onto Corporate America… and still manages to be a heck of a romantic film. Brand new 4K restoration of the film from the original camera negative produced by Arrow Films exclusively for this release is a revelation. Home video has never been kind to The Apartment (even on the most recent Blu-Ray). Everything is corrected with this transfer. It’s gorgeous. Arrow has gone above and beyond with a 4K Restoration that is the best work of the year. Bravo!!!! Arrow has also gone and given the film worthy extras to go along with the amazing transfer. The Commentary by Bruce Block is very informative going over not only the critical assessment of the film but the production, release, reception and eventually, it’s placed in history. Block is a great host that takes you along for this fascinating commentary track. The Flawed Couple is a twenty-four-minute visual essay that David Cairns discusses the very successful collaboration between Wilder and Lemon. The essay culls from The Apartment and other films they worked on together along with some great behind-the-scenes photographs. Billy Wilder ABC is a documentary/visual essay on Wilder’s career. It’s a great overview and discussion running well over an hour it’s the best feature on the disc. 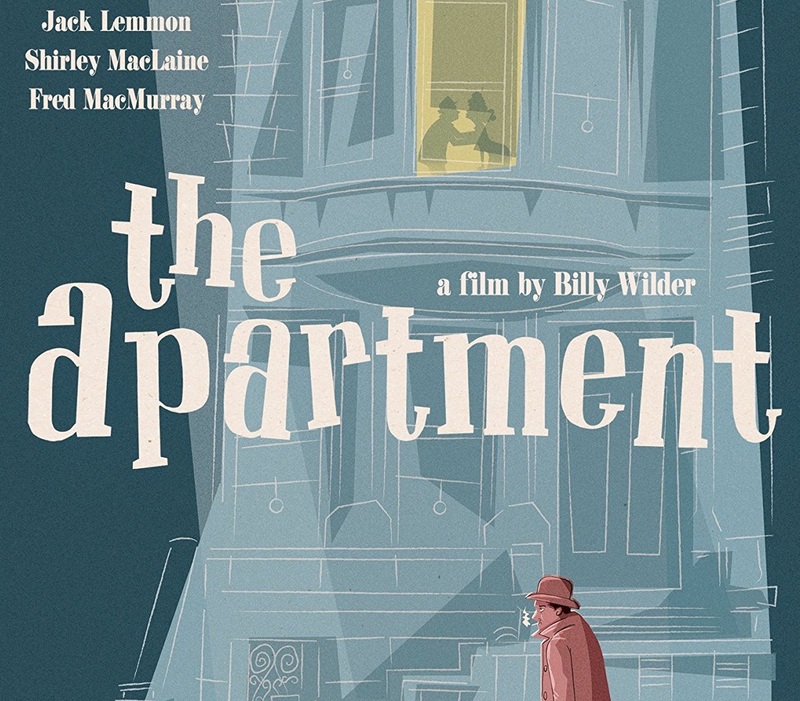 Inside the Apartment and Magic Time are both archival featurettes that come from previous editions that look at the Making-of The Apartment and Lemmon’s career. They amount to well over an hour of content. Arrow has given The Apartment a great release with a flawless transfer and brimming with extras. This is one of the years best discs. Highest possible recommendations. The Apartment is available on Blu-Ray now from Arrow Video.